The cheaper stock isn't necessarily the better buy today. They are two of the country's biggest retailers and are each enjoying some of the fastest sales growth that they've seen in years right now. But that is about where the similarities end between Costco (NASDAQ:COST) and Target (NYSE:TGT). From profitability, to earnings stability, to management's approach to dividends, these companies represent vastly different choices for investors. Let's take a closer look at those differences, beginning with the big-picture metrics. Data sources: Company financial filings and S&P Global Market Intelligence. Sales growth is at existing locations in the most recent complete fiscal year, excluding fuel price changes and currency swings. Target trails its warehouse-retailing peer by a wide margin in most of the important operating metrics. Start with sales growth, where Costco logged a 7% spike in the last fiscal year. Target's gains have been closer to 5% in recent quarters. Still, both companies are posting near-record customer traffic growth, with help from a broadly improving economy. The performance gap is clearer when it comes to profits. Target maintains higher gross margins thanks to its focus on more profitable retailing niches and exclusive brands. However, that advantage is completely overwhelmed by three bigger financial factors. Costco's subscription model approach, through which it charges annual fees for access to its stores, allows for a stronger and steadier profit profile. The chain's warehouse selling atmosphere also makes it safer from the online selling threat, and so Costco isn't being forced to spend aggressively to shift into a multichannel retailer. Finally, Costco can claim a level of customer loyalty that no other retailer, including Target, can match. The chain's renewal rate recently ticked closer to a record 91% despite the fact that it recently raised membership fees. 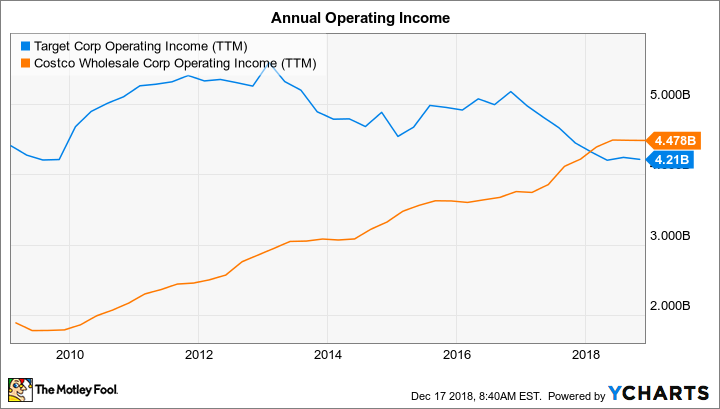 Those trends together help explain why Costco's annual operating earnings have more than doubled in the past decade while Target's operating income is down slightly. TGT Operating Income (TTM) data by YCharts. Costco's standout operating metrics aren't a secret on Wall Street, and so the stock is priced at a premium of 28 times the past year's earnings compared to 21 for the broader market. On the other hand, an investor can buy Target shares at a relative steal of 11 times last year's profit. The price-to-sales matchup paints the same picture, with Costco priced at 0.63 times revenue, Walmart priced at 0.53 times, and Target the cheapest at 0.48 times. Target might be more attractive to certain income investors, too. It is one of the few retailers that boasts membership in the Dividend Aristocrat club, after all, having steadily raised its payout since going public in 1967. It pays a far more generous yield than Costco, and Target's management team also promises a steadier cash return pace. Costco's, in contrast, delivers far less of the retailer's profits back to shareholders each year while supplementing that cash stream with unpredictable special dividends. Choosing Target's stock makes sense, then, only if you prize regular dividend payments and have an aversion to paying a premium for high-performing businesses. But in my view, Costco has demonstrated over the years why it deserves that premium. Its latest operating trends, meanwhile, suggest it will continue to outpace the industry in both sales growth and profits for the foreseeable future. Thus, there's a good chance the stock will continue leaving its peers behind.